The RAZR V3i was sold during the height of the popularity of the Razr series. The Motorola Razr (styled RAZR, pronounced "razor"; sometimes also Siliqua) was a series of mobile phones by Motorola, part of the 4LTR line. The V3 was the first phone released in the series and was introduced in July 2004 and released in the market in the third quarter of 2004. The V3 model was followed soon thereafter by the much improved V3i with a collaboration with Apple Inc. for iTunes to be built-in. Because of its striking appearance and thin profile, it was initially marketed as an exclusive fashion phone, but within a year, its price was lowered and it was wildly successful, selling over 50 million units by July 2006. 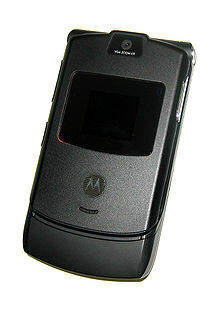 Over the Razr's four-year run, the V3 model sold more than 130 million units, becoming the best-selling clamshell phone in the world to date. The Razr series was marketed until July 2007, when the succeeding Motorola Razr2 series was released. Marketed as a more sleek and more stable design of the Razr, the Razr2 included more features, improved telephone audio quality, and a touch sensitive external screen. The new models were the V8, the V9, and the V9m. However, Razr2 sales were not as good as the original, with consumers moving to competing products. Because Motorola relied so long upon the Razr and its derivatives and was slow to develop new products in the growing market for feature-rich touchscreen and 3G phones, the Razr appeal declined, leading Motorola to eventually drop behind Samsung and LG in market share for mobile phones. Motorola's strategy of grabbing market share by selling tens of millions of low-cost Razrs cut into margins and resulted in heavy losses in the cellular division. In October 2011, Motorola resurrected the Razr brand for a line of Android smartphones: the Droid Razr for Verizon Wireless (known simply as the "Motorola RAZR" on other networks) and an improved variant, the Droid Razr Maxx. The new "Razr" line shares the trademark thinness and stylized tapered corners with the original. The V3 was first released in Q3 2004. The team of the V3 put together a number of design choices that set the device apart from the competition. The phone had the thinnest profile at the time on a clamshell set, sported an electroluminescent keypad made out of a single metal wafer and used an industry standard mini USB port for data, battery charger and headphones, all in an aluminum body with an external glass screen. It sold 130 million units during its lifespan, being the best selling clamshell phone to date. Complaints were made about allegations of dust accumulating between the V3's plastic screen and LCD glass, possibly through an external side button. Access to the dust requires peeling off the plastic cover, usually followed by a replacement cover. A black version was produced for distribution in the 77th Academy Awards gift bags, and was released in early May 2005. While distribution was initially limited to specific carriers in North America, the black V3 was widely available elsewhere. The first pink version was released in October 2005, and as of June 2006, was available in the United States from T-Mobile (as Razr V3 Magenta, after the T-Mobile—and its parent, Deutsche Telekom's—corporate color, but called Razr V3 Pink in other countries, including other T-Mobile networks), Verizon, Cingular Wireless, Suncom Wireless, Cellular One from Dobson Cellular Systems (each in a different shade). It was available in Canada from Bell, Rogers Wireless and Telus, and in the United Kingdom from T-Mobile and the Carphone Warehouse. $25 of sales from the Rogers pink V3 went to Rethink Breast Cancer. It was also available in all Movistar-serviced countries and Claro (Telcel). Another version of this phone was released in the Republic of Korea (South Korea) on June 1, 2005. This version has the similar physical appearance as the original V3 but instead of GSM, it is a CDMA phone for SK Telecom. It is the first CDMA version of the Razr without the expandable memory, Bluetooth and SIM card, since Motorola Korea's system was able to produce its own model before worldwide GSM format release. It has a 1.3-megapixel camera, video recording, 80 MB of internal memory and a variety of UI features, such as mobile blog, Yoga graphic book, Diet diary and lottery number generator for Wellness theme. It also comes in colors other than those mentioned above. Black, pink, and lime models are seen around Korea. On February 8, 2006 Motorola Korea released its own slide-phone model for the Razr named Z model name MS600. Unlike most other versions, the MS500 version is packaged with a charging dock and has three metal terminals on the back side immediately under the battery cover. Also, as the add-on to the MS600, MS500 Lime Razr has been in circulation in South Korea since October 2006 along with the Motorola KRZR Black and Motorola KRZR Fire (Red). The Razr V3re (also known as V3_06) is a GSM model that has been updated to support EDGE and Crystal Talk technology. It is nearly identical to the original V3, having no memory card slot and with a VGA 4x zoom camera. It can be identified by a slightly larger notch under the Motorola logo when closed, a black matte Motorola logo in the battery cover instead the metallic silver logo in the V3 and a software version starting with R3442A. It is available in North America from T-Mobile, AT&T in the US, Rogers/Fido in Canada and Vivo in Brazil (using both 850 MHz frequency and 1800 MHz. This one with the old-named Telemig Celular, a Vivo company) It is also available in three colors; Orchid Pink, Silver, and Stone Grey. Contents in the box include quick start manuals and its charger. The V3r and V3t are models sold by T-Mobile, AT&T (formerly Cingular), and Canadian cellular services such as Rogers Wireless. These models are virtually identical to the V3 and V3i, except they use Motorola's Digital Audio Player instead of iTunes k. T-Mobile's V3r offers a Voice Notes feature which permits forwarding your audio recordings to voicemail as the only storage method. However, a publicly available SEEM edit permits users to enable the hidden Voice Records feature. Voice Records allows you to save voice recordings locally to phone memory. Currently, Voice Records is limited to less than two minutes of audio recording and stores the resulting records as .avr format files on the a partition within phone memory. In contrast, currently available SEEM edits can expand the maximum size of video recordings. T-Mobile V3t phone memory is 10.0 MB total, including all system files. This space is divided unevenly into a and c partitions. Memory on partition a is larger than 2 MB and contains system files, including some of the branding images for the phone carrier. Partition a also contains the avr structure for the hidden Voice Records feature. Partition c is larger than 5.5 MB and stores user data, including images, sounds, videos, text notes, calendar entries, phone book entries, Java applets and web cache. V3r and V3t phones sold by T-Mobile come equipped with Java-based software that supports T-Mobile's "MyFaves" rate plan. Publicly available third party tools can remove this Java software and other system or locked files to free memory for other uses. Canada's Rogers Wireless also carries them for a reduced price compared to the original Razrs. The V3i was announced in November 2005, and addresses some of the faults of the original Razr V3, including a better (1.23-megapixel) camera with 8x digital zoom, an improved external and internal display, also support for microSD cards of up to 512 Mb maximum. V3i is functionally very close to Motorola V635 model. The V3i comes in two versions: one with iTunes and one with Motorola's Digital Audio Player (DAP). The iTunes version of the phone has a 50 or 100 song limit restriction ("cap") depending on where the phone model was made. The Motorola DAP does not suffer from this cap; however, it takes considerably longer time to load and uses the V3's battery at a much faster rate than iTunes does. The phone's looks have also been subtly changed. It was announced on December 8, 2005 that Motorola had teamed up with Dolce & Gabbana to produce a Special Edition Gold Razr V3t. Only 1,000 of these have been made and sold for a premium price. The launch of the V3i phone comes with the supplied battery a "BR50". Technology has since evolved; Motorola has launched a much improved and longer-lasting battery, the "BR56". A recommended initial charge of the "BR56" for over eight hours to obtain its benefits. On June 1, 2006, Motorola and Dolce & Gabbana once again released their limited edition gold phone. This model includes a D&G cell phone holder, a signature leather pouch, Bluetooth headphone, and FM earphones. It was available from all major Motorola retailers and select D&G boutiques. The Motorola Razr V3i was released to most worldwide markets in the Q4 of 2005–2006. In the U.S. the phone was released through Cingular Wireless on September 6, 2006, with a new activation price of $299, while T-Mobile released the Dolce & Gabbana V3i exclusively in the United States. The V3im is the iTunes version of the Razr V3i available in the UK market with a 100-song cap. In January 2006, Canadian Telus, Bell Mobility and Aliant Mobility, Venezuelan carriers Movistar and Movilnet, and Brazilian Vivo began carrying the V3c. In April 2006 Cricket Communications began selling the V3c. The handset was also made available for Metro PCS. The Razr V3c supports CDMA 2000 1xRTT and 1xEV-DO third generation wireless technologies. This is the technology Verizon Wireless uses to provide their V CAST multimedia service. The coverage of this feature, however, may not be available everywhere. US Cellular and Alaska Communications Systems, Alaska's CDMA provider, also carry the V3c. It also has approximately 41.2 MB of internal memory, although only about 36 MB are available for use. The V3c does not support expansion with a memory card. The original version of the V3c was charcoal gray, and a light pink version called Satin Pink (different from the GSM Magenta/Pink and the AT&T Cotton Candy versions) was released by Verizon Wireless in January 2006. Telus Mobility, Bell, Aliant, and Vivo also carry pink versions of the V3c. V3m is a CDMA version of the Razr. As an upgrade to the V3c, it features a microSD card slot for up to 2 GB of memory expansion, a longer-lasting battery, and 40 MB of internal memory. The V3m came in silver, pink and red although the original release as well as models that used to be available on the Sprint CDMA network featured the gunmetal gray color of the V3c. For a limited time Alltel and US Cellular offered a Fire Red color. This model is not available in the UK as they use GSM, not CDMA, although the V3x is on sale there. Due to many Sprint customers complaining about less than expected battery life, Motorola offered free high-capacity batteries to Sprint customers who contacted Motorola's customer service line with battery life complaints. Verizon Wireless disabled certain features on the V3m including the ability to transfer data files to and from the phone via Bluetooth (a specific protocol called OBEX). Verizon has also blocked the transfer of most data over USB, such as ringtones. These phones also run Binary Runtime Environment for Wireless (BREW), which signs each application to the phones Electronic Serial Number, or ESN, thus preventing the use of free applications (including Back Up Assistant). The equivalent models offered by competitors (such as the V3t by T-Mobile) still retain these features. The V3m on Verizon will play .WMA formatted music files placed in the my_music directory of the removable memory chip, but although the telephone will accept a 2 GB memory chip, only a portion ( ~ 600 Mbytes) can be accessed by the music player. Stereo headphone playback can be achieved with a miniature USB to 3.5 mm phone jack adapter containing the appropriate interface circuitry; adapters designed for hands-free handset operation may not work. Verizon also installs their own user interface instead of the default Motorola interface that they used to use in the past. This has led to many Verizon Wireless users to resort to using their own artificial means of reverting their phones back to an original Motorola condition, or to that of a Verizon phone that has some of the disabled features enabled. A newer Verizon version of the phone has been upgraded and features limitless video capture, easier laid out menu system and the ability to customize the external screen. The phone is still unable to sync to a computer via USB cable for anything other than charging, unless a software such as Bitpim is used to access files. Partnering with Motorola, US Cellular and Sprint released a special Product Red Razr and Bluetooth H500 headset to help support Global Fund programs which positively impact the lives of women and children affected by HIV/AIDS in Africa. Also in the UK there is a Product Red V3i, SLVR, and Bluetooth H3 headset. Announced in March 2005, the V3x was formerly known as the Motorola V1150. Externally, it appears to be a larger V3, albeit with enhancements such as a 2.0-megapixel camera. Internally, it is quite different, utilizing a different microprocessor, chipset, an Nvidia GoForce 4200 GPU, and radio ICs. As a 3G product, its feature set is closer to that of phones such as the Motorola V980, e.g., two cameras instead of the single camera typical on GSM or CDMA products. However one of the main attractions of the Razr V3, the fact that it is very thin, is no longer present in the V3x; although it was the smallest phone available in the UK on the 3 network at the time of release, compared to other contemporary phones, it was only average-sized. It won the "Best 3GSM handset" at the 2006 3GSM World Congress. In Japan, a 3G(W-CDMA) NTT DoCoMo version of the V3x was released in late August 2006. This version has IrDA. Announced in July 2006, the V3xx is a 3G Category 5/6 (3.6 Mbit/s) HSDPA and EDGE supported handset. It is extremely similar in appearance to the compact V3i design, but incorporates an improved feature set with a 1.3-megapixel camera in place of the 1.23-megapixel, 50 MB of internal memory, support for microSD and Bluetooth A2DP. Like the V3x, it is also equipped with a secondary screen and a higher resolution 240x320 pixel (QVGA) main screen. The V3xx was made available for purchase internationally on the 3 network in November 2006, and is now available on AT&T (formerly Cingular) for free with a new 2-year contract. The secondary camera is not available in the United States. The built-in GPU, manufactured by Nvidia (model GoForce 4800) is capable of rendering 3D images through OpenGL ES. The phone includes a much faster CPU as well, making the performance of all features, including 3G/Data much more real-time. Menuing delays common to the slower V3 platform are gone. With the new CPU, the V3xx Phone also includes a fast USB V2.0 for rapid ringtone/image/mp3 file downloading. Older V3's were limited to USB V1.1. Unlike with the V3 and V3i which were both quad band GSM, and thus worked equally well on any GSM network in the world, the V3xx comes in different variants depending on the local frequency bands used for GSM and UMTS/HSDPA. The North American V3xx is Tri band (850 MHz/1800 MHz/1900 MHz) GSM and dual band (850 MHz/1900 MHz) UMTS/HSDPA, whereas the version sold in Europe and Asia is tri band (900 MHz/1800 MHz/1900 MHz) GSM and single band (2.1 GHz) UMTS/HSDPA. This is likely due to the need to fit the internal components of the V3xx into a small casing; as of early 2007 global phones that support quad-band GSM and tri-band UMTS/HSDPA are considerably bulkier than the V3xx. The M702iS version was released as the NTT DoCoMo version of the V3xx which does not have GSM, HSDPA but rather IrDA. Motorola Razr maxx (or MotoRazr maxx) was released at the end of 2006 in Europe and on April 27, 2007 elsewhere. The maxx is an upgrade of the popular V3x and is Motorola's second HSDPA 3.5G phone after Motorola Razr V3xx. Although almost identical to the V3x in use and features, the maxx supports additional external touch keys for music control and retains the size of the original Razr V3. The Razr maxx V6 (European Version) will not work with AT&T's HSDPA network for it lacks the 850/1900 MHz W-CDMA bands. Alternately, prototype versions of the maxx are quadband phones featuring the 850/900/1800/1900 MHz bands. This handset has been released on Telstra's NextG network under the original name "Motorola Razr maxx V6". This phone features compatibility with both the original 2100 MHz band and the newer NextG band, 850 MHz. It should therefore also be capable of roaming to the AT&T 850 MHz HSDPA network. The front of the phone is branded with the Telstra logo and on-screen presentation graphics have a Telstra theme. The phone was released by Telstra for outright purchase in late 2006 at a price of about A$800. However, the phone has been plagued with hardware and software reliability problems that are well documented in Australian phone discussion forums. It has not sold well and Telstra now[when?] owns a large inventory of unsold stock. The phone was repackaged late in 2007 and sold with a prepaid plan for $250, locked for use only with Telstra SIM cards. Many of the post-paid phones sold by Telstra in 2007 were inadvertently locked. This handset has been released on Hutchison's 3 network under the original name "Motorola Razr maxx V6". The back of the phone is branded with the 3 logo, also have the customized home screen, internal memory is increased to 60 MB, the phone startup screen is modified, and on-screen presentation graphics have a 3 theme. The Razr maxx Ve is available exclusively in the United States for Verizon Wireless customers. The maxx Ve features EV-DO instead of HSDPA and CDMA2000 1x instead of GSM/UMTS. The Razr maxx was a new 3G HSDPA and EDGE handset predated by the Razr V3x. Initially known as the "maxx V6," it was released in Europe by the end of 2006. Additionally Motorola had released pictures on its website of the Verizon version. The original version has a 2.0-megapixel camera with LED flash, a large 2.2-inch (56 mm) screen with 240x320 QVGA display (like the V3xx) and 50 megabytes of internal storage. While gaining a significantly improved featureset, it will maintain the same thin profile of the original Razr V3. Key to its design are a glass fascia with external touch-sensitive controls for MP3s. This phone was available in Australia from Telstra on their 850 MHz Next G network. The Verizon Wireless version became available on April 24, 2007. The Verizon Wireless version, the Razr maxx Ve, did not have the second camera on the inside of the phone. Instead, there was a shutter button for focusing and picture taking. The Ve featured Verizon's menu system, but is said to support OBEX profiles, unlike Verizon's current Razr V3m. Like previous Model MS500, Motorola Korea announced its Korean version of WCDMA Razr HSDPA, known as Razr Luk. The MS500W will upgrade its screen to 2.2 inch TFT QVGA, 1.3-megapixel camera with bluetooth and microSDHC support. The model will feature different color pattern compare to previous MS500, and it is expected to hit Korean market by late February 2009. The Razr VE20 was an updated CDMA model of the original Razr. It was released in the U.S. for Sprint, Alltel, and US Cellular. It incorporates some of the design elements of the Razr² V9m at a reduced price. Its rounded clamshell body is almost as thin as the Razr V3m. it features a QVGA main display, outer display with virtual touch keys, 2-megapixel camera, stereo Bluetooth, and a microSD memory card slot up to 8 Gb. The Razr2 is the successor to the popular Razr series. The Razr2 is 2 mm thinner than its predecessor but slightly wider. Some versions feature Motorola's MotoMagx operational platform, based on the MontaVista Linux OS. The Razr2 was made available on every US carrier, and EVDO, GSM and HSDPA versions of it were released by late 2007. The Razr2 line consisted of 4 models: V8, V9, V9m, and V9x. The phone improved picture quality, speed and multimedia capabilities over the original Razr. It also featured an external screen with touch sensitive buttons which allowed users to use some of the phone features without opening the flip, and Motorola's CrystalTalk technology to improve call quality and help reduce background noise. Different color variants were released, including a Luxury Edition and a Ferrari Edition. The Razr3 was under development in 2008 but it was cancelled following the end of the UIQ platform, which was going to be its software. Only one model, the V13, was eventually released in late 2009 exclusive to South Korea. Being the slimmest phone during its release in 2004, the Razr easily stood out amongst other phone models. It was one of the most popular mobile phones since its first release, having been spotted in the hands of celebrities and business people alike until the advent of smartphones, and it is frequently seen in reruns of movies and TV shows. It was also a token piece in the popular modernized board game Monopoly Here & Now. The Razr became identified as a "fashion" product and an iconic cell phone in the late 2000s. The Razr was used in several television shows and featured in several movies. In the 2006 film A Good Year, Russell Crowe's character Max Skinner used a BlackBerry whilst working as a high-flying London financier, but chose a black Razr to accompany his later laid-back life in rural Provence. Notable TV occasions were the season three finale of the TV series Lost in which Jack Shephard used a Razr (an important plot point which anchors the episode's chronology), the HBO hit sitcom Entourage had characters specifically Ari Gold using it, and the US hit series Burn Notice in which Michael Westen used a Razr until 2009. In Season 5 of 24, President Charles Logan used a Razr as his personal cell phone. Contestants on the NBC adventure reality show "Treasure Hunters" were given Razrs for communication with the host and each other throughout the season. The Product Red edition of the Razr was launched by Oprah Winfrey and Bono for charity. A grey-coloured V3 was also used by Jeremy Clarkson on BBC's Top Gear during outtakes when he got a call at the start of the show. Even in 2012, the Razr was used as CIA-special agent Rex Matheson's phone in the 4th season of Torchwood. It was popularised in South India through the movie Vettaiyaadu Vilaiyaadu, in which Kamal Haasan was seen using the phone. In the computer game Counter-Strike: Source, the character Leet can be seen holding one. In Prison Break Series, Alexander Mahone used the Motorola V3. Also, in the 2006 film The Devil Wears Prada, characters played by Meryl Streep and Stanley Tucci used Moto Razr phones. In the 2017 Square Enix game Life is Strange: Before the Storm, the main character's phone is a Motorola RAZR, decorated with stickers. ^ Joel. "More Motorola RAZR V3 Pics". gizmodo.com. ^ "Motorola embraces the ethos of cool". MSNBC. April 11, 2006. Retrieved December 22, 2006. ^ German, Kent (November 9, 2005). "Razr refresh: Motorola's fashion cell phones". CNET. p. 3. Retrieved October 25, 2007. ^ "Motorola Ships 50 Millionth MotoRazr" (Press release). July 18, 2006. ^ The 20 bestselling mobile phones of all time. Telegraph. Retrieved on July 10, 2013. ^ Ziegler, Chris (May 15, 2007). "The Motorola Razr 2". Engadget Mobile. Retrieved June 23, 2007. ^ Ottawa, The. (January 5, 2008) Thin Razr 2 sales cause slide in Motorola share price Archived August 28, 2015, at the Wayback Machine. Canada.com. Retrieved on 2013-07-10. ^ Crockett, Roger (January 24, 2010). "What Can Brown Do for Motorola?". Business Week. Retrieved December 15, 2010. ^ Reardon, Marguerite (May 15, 2007). "Is Motorola's cell phone revamp enough?". News. CNET. Retrieved December 15, 2010. ^ Lappin, Joan (February 20, 2007). "Motorola's Zander Has Real Trouble Now". Forbes. Retrieved December 15, 2010. ^ "Motorola to Split Into Two After Phone Sales Slide (Update10)". Bloomberg. March 26, 2008. Retrieved April 2, 2009. ^ Banks, Emily (October 18, 2011). "Motorola Unveils Droid Razr, World's Thinnest Smartphone". Mashable. Retrieved November 18, 2011. ^ Shukla, Gaurav (October 18, 2011). "Motorola Razr debuts, coming in November". AndroidOS.in. Retrieved November 19, 2011. ^ Lashinsky, Adam (May 31, 2006). "Razr edge". CNN. Retrieved May 13, 2010. ^ "Modding the Motorola Razr V3 | razr mods | Razr Software Upgrading — Cleaning the Dust from the LCD". Themotoguide.com. Retrieved April 2, 2009. ^ Kane, Margaret (January 31, 2006). "Oscar goody bags looking Razr sharp". CNET News.com. Retrieved September 10, 2006. ^ "About the V3re". Hack The Razr. Archived from the original on January 6, 2009. Retrieved April 2, 2009. ^ "Motorola Razr V3i". Motorola. 2006. Retrieved January 20, 2007. ^ Vogel, Sandra (June 6, 2006). "Motorola Razr V3i Review". CNET News.com. Retrieved January 20, 2007. ^ "Motorola United Kingdom — Razr V3im — Cell Phones". Direct.motorola.com. Retrieved April 2, 2009. ^ "Mark_Venture's Verizon Phone Info Page". Mark.cdmaforums.com. June 5, 2007. Retrieved April 2, 2009. ^ "Motorola's Razr V3x gets "Best 3GSM Handset" award — Mobile Phones — Crave — CNET Asia". Asia.cnet.com. February 15, 2006. Archived from the original on February 27, 2006. Retrieved April 2, 2009. ^ "Motorola Razr V3xx". GSM Arena. December 20, 2006. Retrieved September 10, 2006. ^ a b c "MOTORAZR MAXX V6 - Full Specification". motorola.com.hk. ^ a b c "Motorola MotoRazr Maxx". motorola.com. ^ Ziegler, Chris (October 16, 2006). "Verizon to get its own MotoRazr Maxx". Engadget Mobile. Retrieved December 21, 2006. ^ "모토로라 '레이저' 3G로 부활 :: 네이버 뉴스" (in Korean). News.naver.com. February 6, 2009. Retrieved April 2, 2009. ^ "Motorola Razr VE20 specs & Features (Phone Scoop)". Retrieved January 6, 2009. ^ "motorola US - unlocked cell phones & modular smartphones". direct.motorola.com. ^ "Is 'Treasure Hunters' copying 'Amazing Race'?". MSNBC. July 11, 2006. Retrieved August 21, 2007. ^ "iPod nano, Motorola Razr to go Red for charity". MacNN. October 12, 2006. Retrieved August 21, 2007. 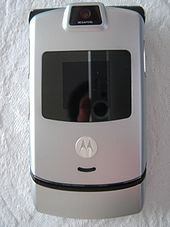 Wikimedia Commons has media related to Motorola RAZR. This page was last edited on 2 April 2019, at 12:11 (UTC).